The proposed resolution expresses "deep concern" at "the violence and excessive use of force by Venezuelan security forces against unarmed, peaceful protesters" and "recent attempts to block the delivery of humanitarian aid"
Supporters of Venezuelan President Nicolas Maduro demonstrate in Caracas on February 27, 2019. The United States is calling for a vote on a U.N. resolution urging "the peaceful restoration of democracy" in Venezuela, free and fair presidential elections, unhindered delivery of humanitarian aid to all people in need — and making clear its support for opposition leader Juan Guaido. The draft resolution is expected to be put to a vote Thursday afternoon, a council diplomat said, speaking on condition of anonymity ahead of an expected announcement. But it is likely to face a veto from Russia, which backs Venezuelan President Nicolas Maduro and the May 20 election that kept him in power. The proposed resolution, obtained Wednesday by The Associated Press, also expresses "deep concern" at "the violence and excessive use of force by Venezuelan security forces against unarmed, peaceful protesters" and "recent attempts to block the delivery of humanitarian aid." 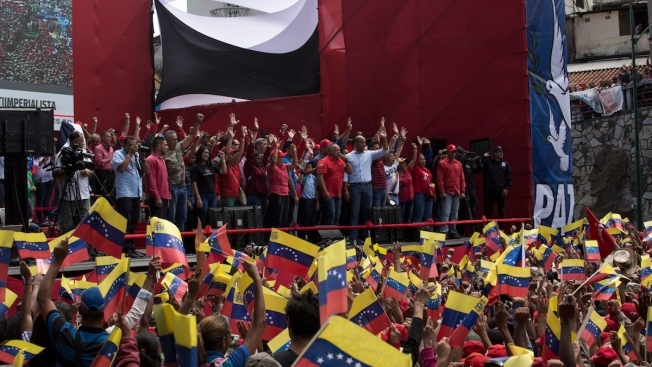 At a Security Council meeting Tuesday, Russian Ambassador Vassily Nebenzia called the weekend attempt by the Venezuelan opposition to carry in aid shipments from Colombia nothing but a "humanitarian show" created by the United States. He said the Trump administration's sole aim is "regime change, including with threats to do so via foreign intervention" in violation of the U.N. Charter's principle of noninterference in the affairs of another country. Elliott Abrams, the U.S. envoy for Venezuela, shot back: "I reject from start to finish, I reject from top to bottom, accusations of military interventions from a country that is occupying the territory of Georgia and Ukraine." Before the council meeting, Abrams told reporters that U.S. policy "is to use as much diplomatic and economic and political pressure as we can" along with the dozens of countries backing Guaido "to support the Venezuelan people's desire for democracy." The U.S. draft resolution to be voted on makes some significant changes from the administration's initial draft, in what one diplomat called an attempt to address Russian concerns. Russia had circulated a rival draft resolution "expressing concern over the threats to use force" against Venezuela and "to intervene" in its domestic matters. Its draft reaffirmed that international disputes should be settled peacefully and urged that the Venezuelan situation to be settled "through peaceful means." The initial U.S. draft's only mention of "peace" was to recognize "the disruption to peace and security in the region caused by the actions of a regime that have caused an economic collapse." More than 3 million Venezuelans have fled their homeland in recent years in search of food, medicine and opportunities elsewhere in the region. The final U.S. draft doesn't mention the use or threatened use of force but it does make several references to peace. It "calls for the start of a peaceful political process leading to free, fair and credible presidential elections." It "supports the peaceful restoration of democracy and rule of law in Venezuela." And it asks U.N. Secretary-General Antonio Guterres "to help ensure free, fair, and credible presidential elections, and encourages subsequent peaceful, inclusive, and credible initiatives to address the prolonged crisis in the country." The Russians, however, are likely to object to another statement in the new U.S. text. It notes "the constitutional authority of the democratically elected National Assembly," which Guaido heads, and commends its efforts to release political prisoners, fight corruption and provide amnesties to civilian and military officials who support "the restoration of democracy." As for aid, the Trump administration's initial draft expressed "deep concern" at "recent attempts to block the delivery of humanitarian aid" and stressed the need to facilitate access and delivery of aid to all Venezuelans in need — similar language to the final draft, which added a call for "unhindered access."